Electricity can be a major problem when travelling in an RV. Between GPS, coffee machine, television, etc., we consume a great amount of energy. To avoid cutting-off your already fun-filled dream vacation with your loved ones, choosing best RV solar kit is the best option for your energy supplying battery. Components of RV Solar Kit and Their Functions. Below Are Factors To Consider Before Buying an RV Solar Panel Kit. There are 4 categories of solar panel kit: flexible, amorphous, monocrystalline and polycrystalline. The amorphous: This solar panel kit works very well in a low-light condition. Its average yield is up to 7%. The monocrystalline: This type of panels is very popular in the photovoltaic market, because of their ability to generate enough energy for a very long time. Its average yield lies between 12% and 18%. Polycrystalline: These panels are best suited for environment where direct sunlight is guaranteed. The average yield is about 13%. Most solar kit always comes with panels, inverter and charge controllers. However, if you purchased a solar kit that doesn’t contain some of the three components above, you’ll have to buy it separately. In addition, you’ll be needing a battery for energy storage. So, what are the roles of these components and how do they function together? We’ll be having a look at them each to give you a better understanding of their roles and functions. Solar panels are placed on the roof to receive direct sunlight. These will cause electrons to be released by atoms, which are then transformed into electricity. However, if you’re in low sunlight environment, a high-grade solar panel will work best and don’t forget to consider your mounting space on the RV rooftop in case you decide to upgrade your solar panel installation in the nearest future. After the solar panel has generated an electricity, it then passes it to the charge controller, which regulate the amount of energy the battery will receive. This is very important in preventing your battery from receiving an energy surge in case the solar panel is exposed to direct sunlight and also protects the battery from discharging to a very low level when there is lack of sunshine. So, solar charge controller helps in prevention of overcharging and undercharging, which can damage your batteries. Having a deep cycle battery help you to store the energy generated from the solar panel for uses while travelling in your RV. So, solar panels work with 12 and 24 volts batteries. This is the amount of power that can be delivered by the solar panels. You can measure this by simply calculating the current output of each solar panel cell. To determine the amount of power needed during your RV trip, calculate the combined amperage of the electronic devices you’ve on board, which can be gotten from their label. Then use an energy calculator (search for it on Google) to work and convert it into volts. NB: 12 volt solar panel is ideal for a short RV trip every few months, while a 24 volt solar panel is suitable for everyday powering of multiple devices. Location is also an important factor to consider when purchasing a solar kit, which greatly determine the solar kit to choose. A highly efficient solar kit should be chosen for use in locations where there is lack of sunlight. Efficiency of a solar kit is the amount of solar energy it can convert to electricity, which are usually represented in percentage form. An efficient solar kit guarantees a high amount of voltage for the onboard devices in your RV. Since you’ll be installing the solar panel on your RV rooftop, durability is an important factor to consider. Check the frame material, because this is the actual panel’s protector. The frame should be corrosion and dent resistant, while also having a lightweight for easy movement when carrying it. Although, aluminum is the material that is mostly used to make these panels, due to it’s lightweight and durability. Safety is also an important factor in choosing a solar kit for your RV. A high-quality solar kit should include built in measures to prevent any form of danger that may arise in your electrical appliances, e.g an inbuilt charge controller that prevents overheating and overcharging. Charge controllers are available in two different types, which are MPPT and PWM. The MPPT charge controller improves the efficiency and performance of your batteries while the PWM is an intelligent switch between the solar panels controlling the current and voltage flow into the batteries and your battery. For RV owners or campers wanting to start using solar energy with minimum budget, Renogy 100 Watts Monocrystalline Solar Kit is the perfect energy generating device to get you started. An easy to set up and install tool with a cable of 28 ft that provides enough room for maneuvering. It can also withstand snow loads and strong wind, which makes it suitable for a low sunlight environment. So, you don’t need to worry about weather condition while enjoying your vacation. This solar starter kit delivers energy that can sufficiently charge appliances like heaters, fan, batteries, etc. to prevent you from feeling nostalgic. It can even be expanded up to 400 watts by hooking it with additional solar panels, in case your power consumption increases. Its charge controller will handle 3 extra 100 Watts solar panels plus an included MC4 connector. In case you need to use AC power, then an inverter should be purchased and added to the kit. So, for an efficient power conversion and supply, Renogy 100w is the ideal solar starter kit. It is thin, light in weight and easy to install. It is strong, solid and guarantees long term operation. It can work under unfavorable weather condition and in a low sunlight environment. It has sharp edge and low voltage. It comes with no warranty from the manufacturer. A monocrystalline solar starter kit for RV, that is capable of recharging your power supplying battery making you have a fun-filled outdoor experience, while the solar kit is operating silently. The solar kit panel allows you to operate every equipment and electronic device that you have onboard, with no need for power hookups, so your family won’t lack electricity throughout the vacation. It features a charge controller that promotes the safe and quick charging of batteries under any condition, making it reliable and useful for situations where many devices are to be powered. It possesses all the necessary tools for easy set up and installation of this solar starter kit within an hour and a 30A PWM charge controller that makes it easy to expand the solar panel up to 400 Watts in case your power consumption increases. It also has a negative grounding controller that protects against electric shock, overcharging, short circuit, overloading and battery reversal. It operates quietly and has all the necessary tools needed for easy set up and installation. It has a negative grounding controller that prevents overcharging and overloading. It features a sturdy and corrosion-resistant aluminum frame panel. It has a big and bulky size. 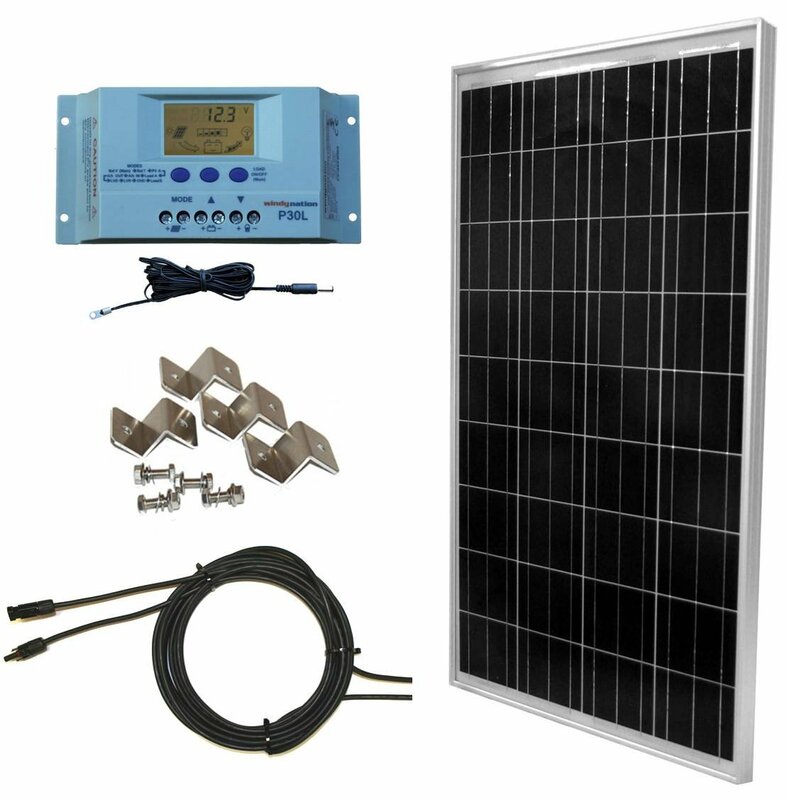 A reliable solar panel kit for RV owners. This solar-energy device is grid independent and provides solution to power backup due to its ability to harness free and clean energy directly from the sun. This polycrystalline solar kit can deliver up to 100W of power, with a total output of 350W hour daily, based on the sunlight condition. It also features a high-quality and versatile P30L charge controller that helps you keep track of voltage, temperature, load draw, amp-hour and amperage, to prevent overloading and overheating, which can damage your devices when charging. 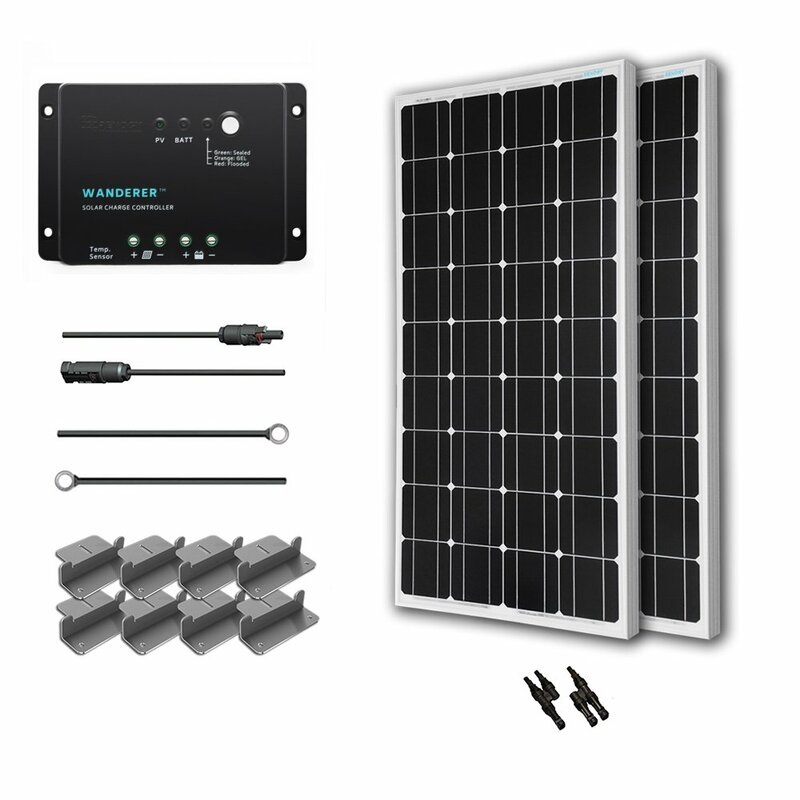 Its versatility allow you to expand it to three 100 watts 12 volts panels or six 100 watts 24 volt panels and comes with all the required equipment for easy set-up and installation, including solar panel installation guide and mounting hardware. 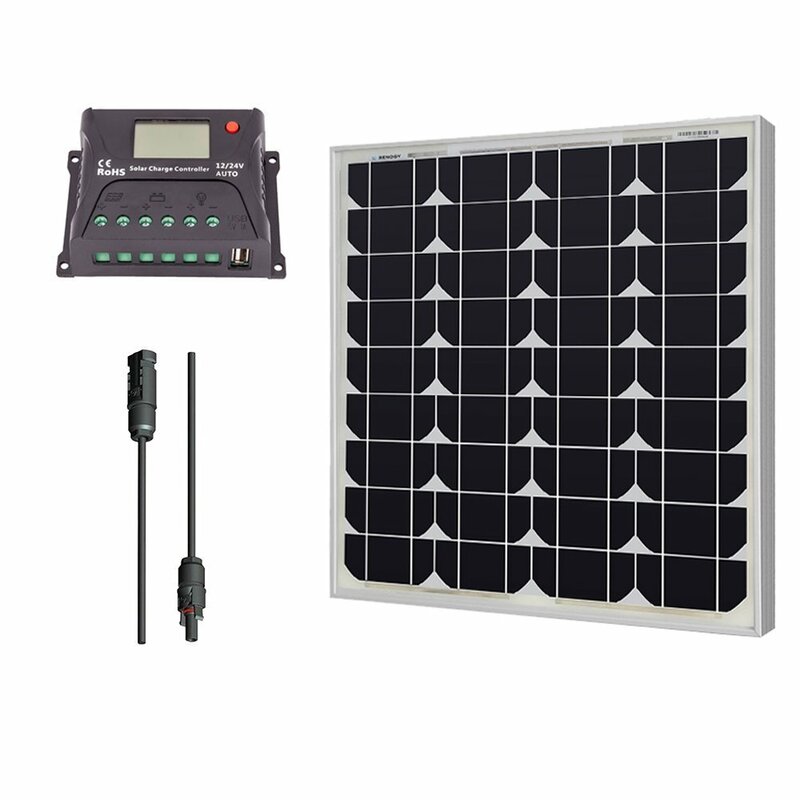 This solar kit is not limited for RV users only, but also ideal for home with boats and cabins as a remote power backup. It is solid and strongly built. It doesn’t get affected by cloudy weather. It has an LCD screen display with battery temperature sensor. Its charge controller is designed to help you monitor everything while charging. It doesn’t have a corrosion-resistant frame. It doesn’t come with a battery of its own. 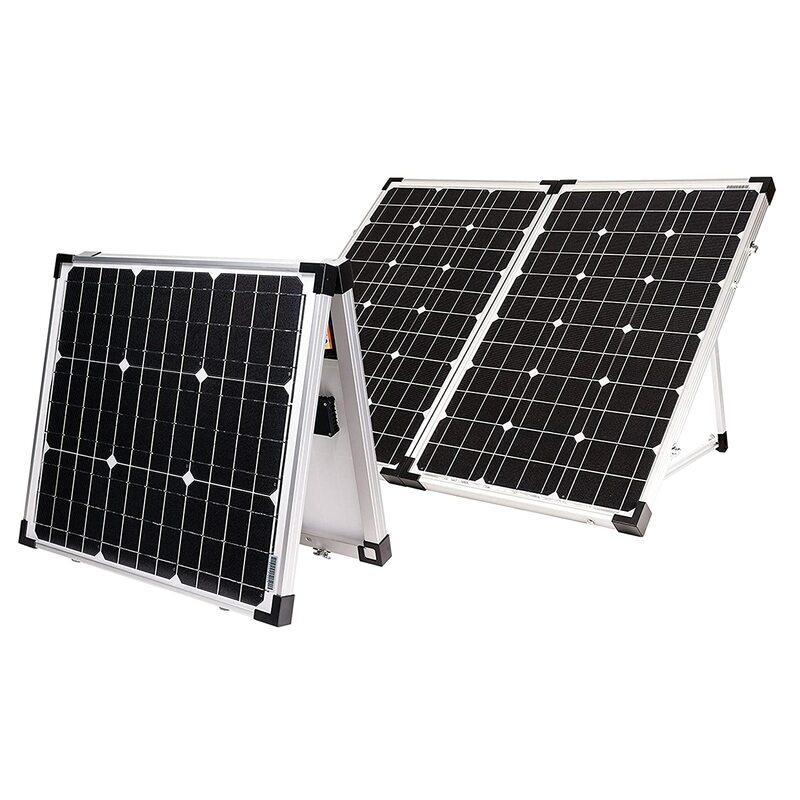 The HQST 100W is among the outstanding solar panels in the market due to it quality construction with a highly conversion efficient modules and rugged materials. This solar panel is made with low iron-tempered, anti-reflective, high transparency glass enhanced with resistance and stiffness enabling it to withstand snow loads and strong wind, there is no need to worry about the weather condition while on vacation. There exist a pre-drilled hole in the back of the panel, making it easy to mount (using mounting systems such as Tilt mounts, Pole mounts and Z brackets) and secure the panels within a limited time. This solar kit has a very low chance of getting shattered or cracked. Due to its light solar charging and portability features, it is best suitable for RV and boat owners, who desired easy installation and setup. It is lightweight and easy to install. It has a very low chance of getting cracked or shattered, guaranteeing its long term usage. It has a 25 year energy delivering warranty. It can withstand snow loads, heavy rain and strong wind. For an easy to setup and fast charging solar panel, Go Power! Valterra Power Us, LLC GP-PSK-120 Solar Kit 120W Portable is the ideal solar kit. This solar kit feature GP-PSK-120 that is capable of carrying a current of 120W. The solar panel will sufficiently charge a 12 volt battery quickly without any stress making it efficient and reliable electricity generating tools for your dream vacation. Its foldable design makes it portable and convenient to carry around. It also comes with all the necessary equipment for easy setup and installation within few minutes, including solar controller you can use to keep track of the system while charging and cables with battery clamps for easy connection of batteries. The carrying case is made of sturdy materials, thereby enabling easy transportation of this solar kit from one place to another without any fear of damage. It is reliable, durable and has a convenient carrying case that enables easy movement and operation. 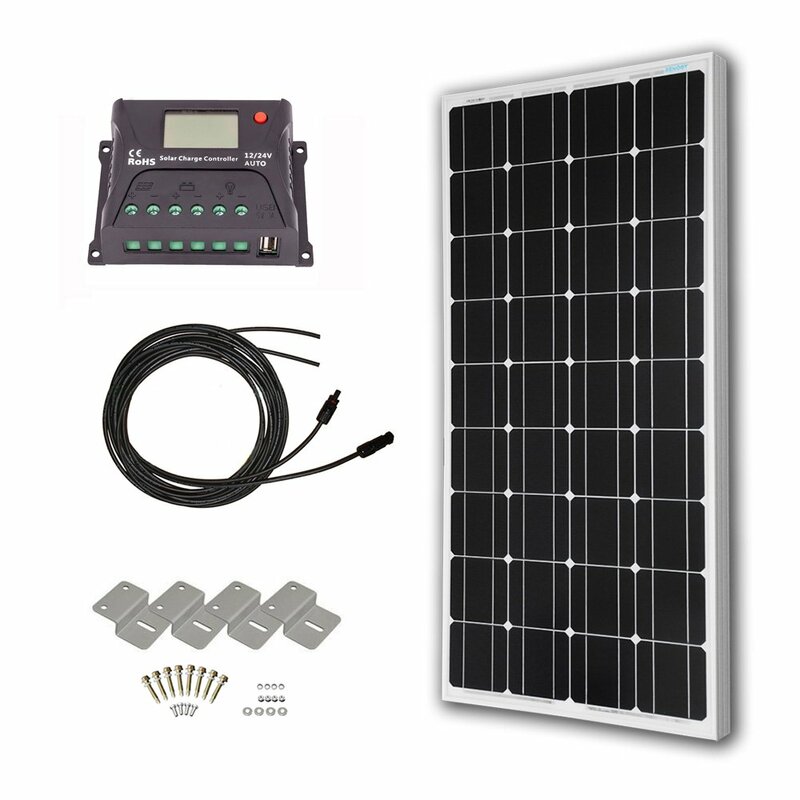 It is easy to setup, install and has a solar controller that allows you to monitor the system while charging. Its inbuilt cables together with clamps allow easy connection of batteries. It has a rugged leg support, which can easily be adjusted. It offers a quick and easy solution for battery charging. Replacement parts are hard to come by. Perfectly made for RV owners, home owners, boat owners and campers, who have preference for off-grid power solution. The two included 100 Watts polycrystalline solar panels deliver up to 800 Watts hour or 65 amp hour power daily (enough to fulfill your family electricity need everyday while on vacation), depending on the sunlight condition. Its user adjustable 30-Amp LCD Display P30L Solar Charge Controller with Battery allows you to keep track of the DC load draw, amp-hours, amperage, temperature and voltage while charging and adjust them appropriately to prevent overloading and overheating. It also features a voice signal that helps draw your attention to the system by reading out any changes that occur. This helps prevent reverse polarity, overloading and overheating. Its 1500W VertaMax DC to AC inverter delivers up to 3000W to get your devices powered all day, which is very impressive. This is suitable for RV campers (who are going for long term vacation) looking for an easy to setup and install, expandable solar kit, that guarantees long term operation. It is easy to setup, install and offer decent power supply to power your devices all day. It has a high-quality construction. It has an LCD display and a user adjustable settings that allow you to adjust any changes that occur in the system to prevent overheating and overloading. It is not suitable for powering AC and microwave. Renogy 50 Watt 12 Volt Monocrystalline Solar Kit is a portable and excellent grid independent power solution. The solar panel features a corrosion-resistant frame, which guarantee its long term usage. It is best suited to outdoor uses such as mountain camping or beach trip when the need to charge your deep cycle RV batteries and power your appliances arise. 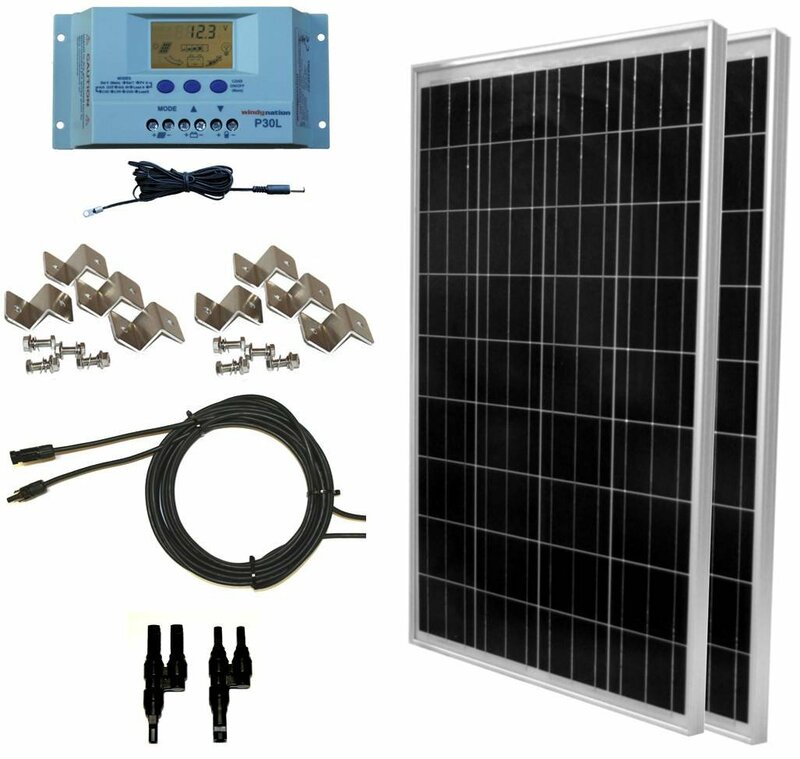 This solar kit features multiple accessories such as connector adapter kit, 10amp charge controller, 9in MC4 Adaptor Kit and a fully self powered grid independence system, which can be expanded on an already owned system. 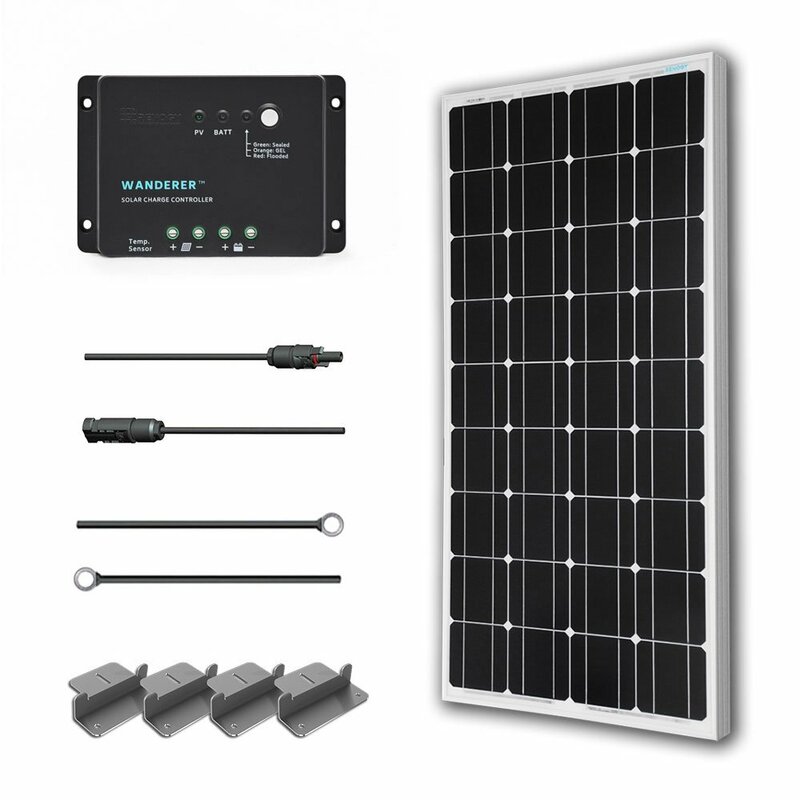 The solar panels come with MC4 lead that matches the MC4 adaptor kit for easy set up and installation of the system. The charge controller is always close to the panel due to it short wiring extension. It is simple to set up and install. It is light in weight and has a self-powered grid independence system. It features a connector adapter kit. It can be used for different applications. It comes with pre-drilled holes for fast mounting, grounding and securing. It can be used with off-grid and on-grid inverters. It can withstand snow and high wind loads. Its features are not that of a high end solar kit. 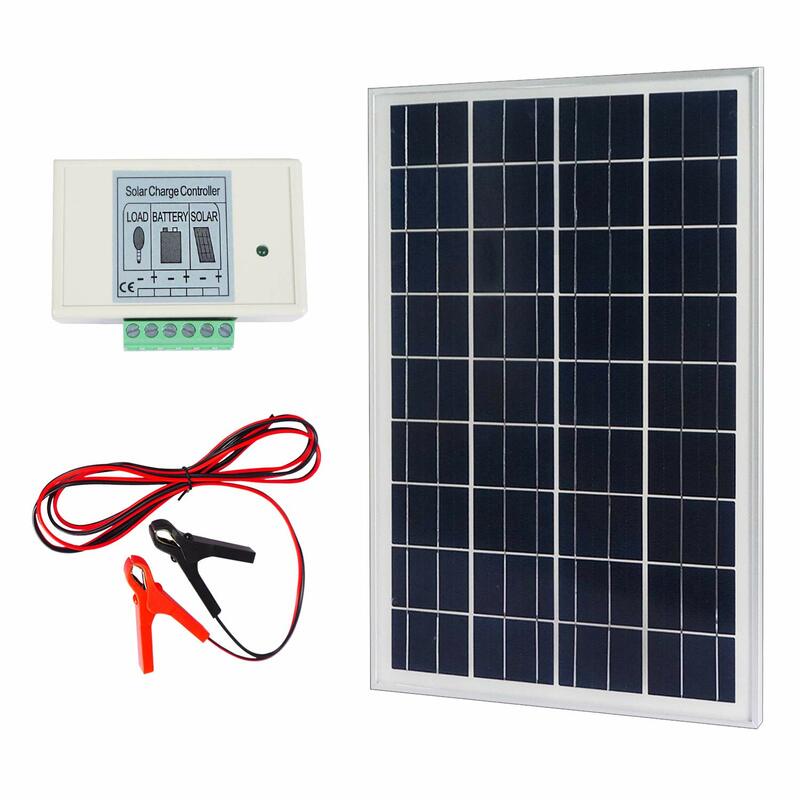 Featuring a 3 meter long cable, 20 watt solar panel and a solar charge controller, this RV solar kit is of high-quality and can easily be operated by beginners. The solar panel is water resistant with white silicon coating around the edges at the back (though the connecting wires and charge controller aren’t waterproof) enabling it to withstand heavy rainfalls and snow loads, plus a protective aluminum frame that guarantees its long term usage. This highly efficient solar kit can deliver great power output no matter the weather condition and can also charge a 12 volt deep cycle RV battery 100% full. It features a highly intelligent 3A Pulse Width Modulation solar charge protector that can switch through 3 stage charging phases automatically (bulk, absorption and float) and also prevent any damages from being caused by the release of excess voltage from the battery. It features an adjustable aluminum stand and a pre installed solar charge controller. It is easy to setup, install and operate. It can deliver a great power output. It comes with a LED light that helps indicate the availability of solar power and its present charging phase. It has low wattage and voltage. The wires do get disconnect easily. If you want to perform the installation yourself, you should apply the following steps: Firstly, decide how and where you’ll place the solar panel, which should be on a flat surface to receive enough sunlight. Drill 4 holes. Pin the solar panel on the roof of your vehicle with 4 bolts, while making sure that the bolts pass through a solid and well fixed material to prevent any possible leaks. You will have to join the regulator (essential to manage the recharge and avoid heating the battery) itself attached to the battery of your RV. You can place the solar panel in a flat position on the roof which will be broad enough if you only use your RV in the summer. However, for winter use and better performance, we advise you to tilt the panel a little. In addition, the air has to circulate under the solar panel to avoid any heat and to evacuate the water.For an optimal performance, you can go through a professional who will install it under ideal conditions to maximize energy gains. When choosing a solar kit for your RV. Ensure it has an efficient monocrystalline solar panel (ideal for long-term power generation ) that can work in a low sunlight environment and a high-quality MPPT solar charge controller that improves the efficiency and quality performance of your battery. In addition, the solar kit should also be easy to setup and install for beginners. With that, you don’t have to worry about the weather condition affecting the energy and power supply of your RV, which will surely lead to more fun filled and exciting adventures with your loved ones.